A Stairway taken by the Lucid presents for the first time an annotated English translation accompanied with a Tibetan critical edition of Tsong kha pa’s commentary on the different types of Noble Beings (Skt. arya, Tib. ‘phags pa) that progress toward awakening. In this edition and translation of his blo-gsal bgrod-pa’i them-skas, Tsong kha pa (1357-1419), revered as one of the foremost masters in the history of Tibetan Buddhism, provides a detailed exegesis of the characteristics and attainments that Noble Beings acquire in advancing toward nirvana through multiple lifetimes in varying cosmological realms. Noble Beings are individuals within the Buddhist spiritual community (samgha) who become constituted by moral virtue, mental quiescence, and cognitive insight through embodying the Buddha’s teaching on the way to nirvana Tsong kha pa details the location and number of lives remaining until nirvana for Noble Beings based on his meticulous analysis of classical Indian Buddhist works like Vasubandhu’s Abhidharmakosa and Asanga’s Abhidharmasamuccaya. 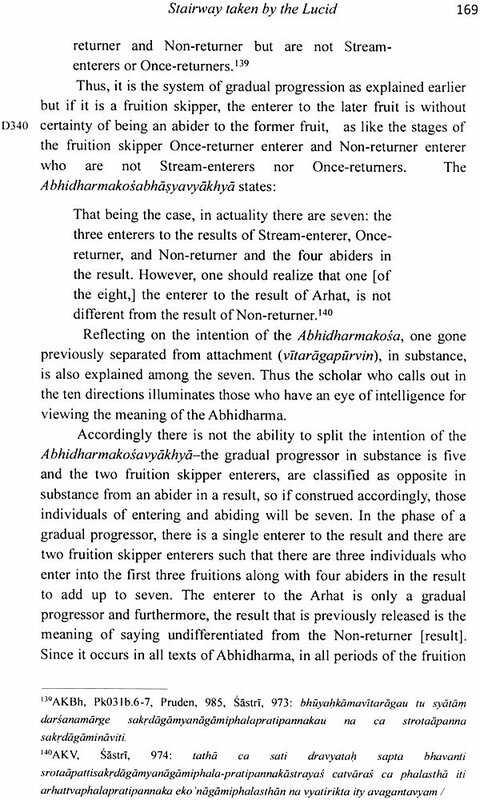 His analysis outlines the qualities and features of Noble Beings such as the Stream-enterer (srota-apanna, rgyun du zhugs pa), Once Returner (sakrdagamin; Ian gcig phyir ‘ong), Non-Returner (anagamin, phyir mi ‘ong), and Arhat (dgra bcom pa). Tsong kha pa’s exegesis of the Arhat in this work is especially important as he presents a refined understanding of this type of Noble Being previously unexamined in the history of Tibetan scholasticism. This work provides an edition and translation of one of Tsong kha pa’s important works, written in his youth, that furnishes a comprehensive typology of Noble Beings that constitute the spiritual community (dge ‘dun, samgha) that Tibetan Buddhists venerate, as well as emulate, in practicing Buddhist pathways to awakening. James B. Apple is currently Associate Professor of Buddhist Studies at the University of Calgary. He received his doctorate in Buddhist Studies from the University of Wisconsin-Madison. His research focuses upon the critical analysis of Mahayana sutras and topics within Indian and Tibetan Buddhist scholasticism. The text edited and translated here is the Zhugs pa dang gnas pa‘i skyes bu chen po rnams kyi rnam par bzhag pa blo gsal bgrod pa’i them skas (literally, The Stairway taken by the Lucid-A Presentation of the Great Beings who Enter and Abide [in the Four Fruitions], hereafter Stairway) by the Tibetan Buddhist scholar Tsong kha pa (1357-1419). 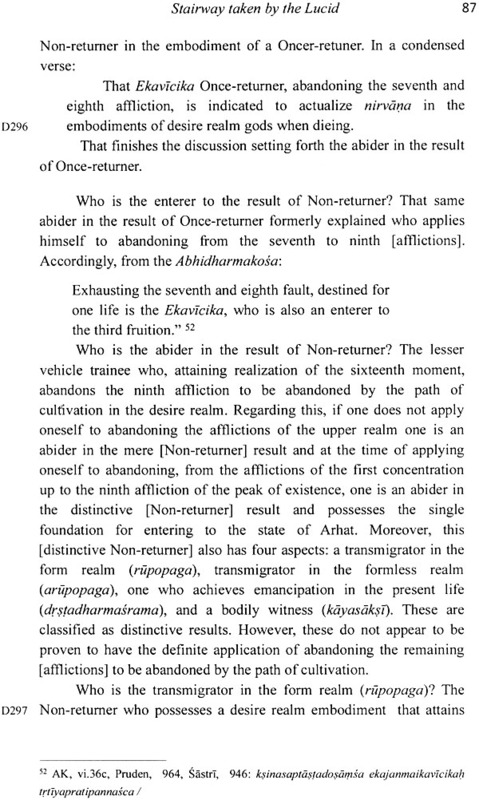 This text consists of a detailed investigation into the enumeration of Noble beings or Noble individuals (‘phags pa ‘i gang zag, aryapudgala) that constitute the spiritual community (dge ‘dun, samgha) that Tibetan Buddhists venerate, as well as emulate, in practicing Buddhist pathways to awakening. 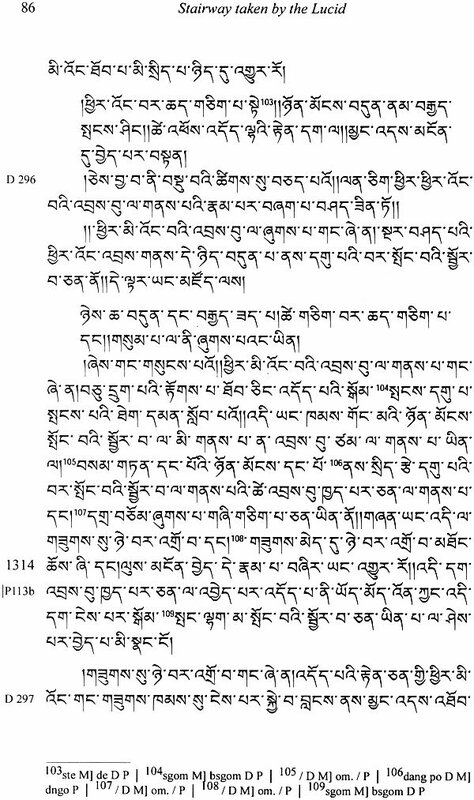 The following pages introduce the translation by discussing the importance of enumerating Noble beings in Tibetan Buddhism, describing Tsong kha pa’s written works related to Noble beings, and providing a historical account of the circumstances for his writing of the Stairway. This translation complements my previous work on this subject (Apple 2003, 2004, 2008) and readers may wish to consult those sources for further analysis and explanation of this topic in the works of Tsong kha pa as well as in Tibetan Buddhist scholasticism. 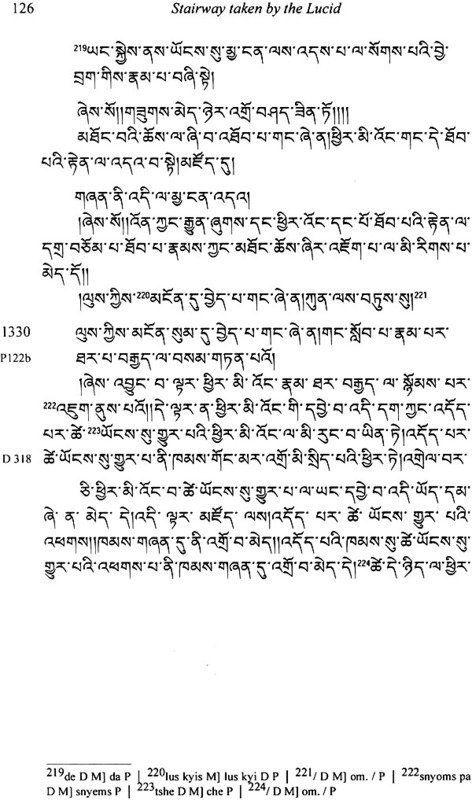 The following work consists of a critical Tibetan edition of the Stairway with an annotated English translation on facing pages. The aim of this critical edition and annotated translation is to provide access to the earliest extant individual Tibetan work that describes the characteristics, attainments, and cosmological locations of Noble beings in Tibetan forms of Buddhism. The edition and translation indicate the meaning and syntax of Buddhist technical terms for the categories and definitions of Noble beings in Tibetan and their correlations found in Sanskrit, as well as in Pali, canonical sources. In this way the work serves as handbook for a comprehensive Tibetan account of Noble beings in traditional Buddhism based on an important primary source in Tibetan. 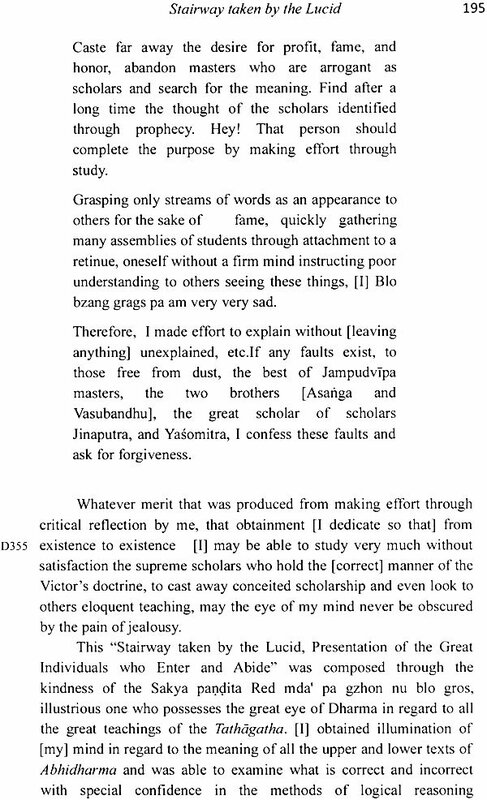 Early Buddhist textual sources as preserved in the Nikayas and Agamas contain numerous instructions and advice that the Buddha Sakyamuni gave to his disciples over the long course of his teaching career to indicate their progress on the path to spiritual liberation, what they had achieved, and their future destiny to achieve spiritual liberation. The Buddha most commonly outlined four levels of spiritual progress: the levels of Stream-enterer, Once-returner, Non-returner and Arhat (described below). These levels of spiritual progress were tersely described by the Buddha and sublevels within the four standard levels were also mentioned. In these accounts, the Buddha, for the most part, outlined a profoundly gradualistic, step-by-step progress in spiritual development that could often take more than one lifetime to reach the liberated goal of Awakening (nirvana). 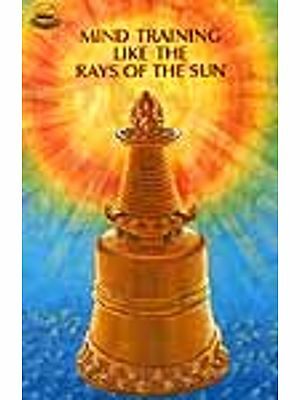 Over the centuries after Sakyamuni’s life, scholarly disciples who followed his teachings reformulated and systematized these accounts of spiritual progress in technical digests and commentaries. 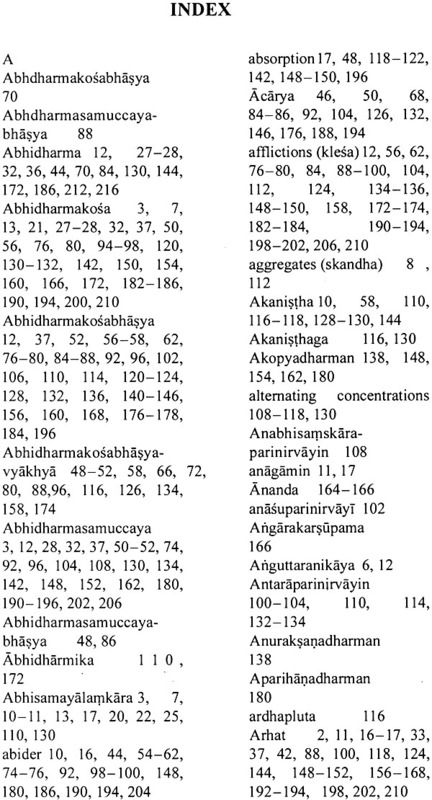 In Tibetan forms of Buddhism, the scholarly accounts of spiritual progress that were received from India came in the form of technical digests such as the Abhidharmakosa, the Abhidharmasamuccaya, and the Abhisamayalamkara, The exegesis and elucidation of Noble beings developed in Tibetan Buddhist scholastic traditions by way of commenting upon the Abhisamayalamkara and the related Indian and Tibetan Buddhist commentarial literature surrounding the Prajnaparamita (Perfection of Wisdom, hereafter PP) corpus. 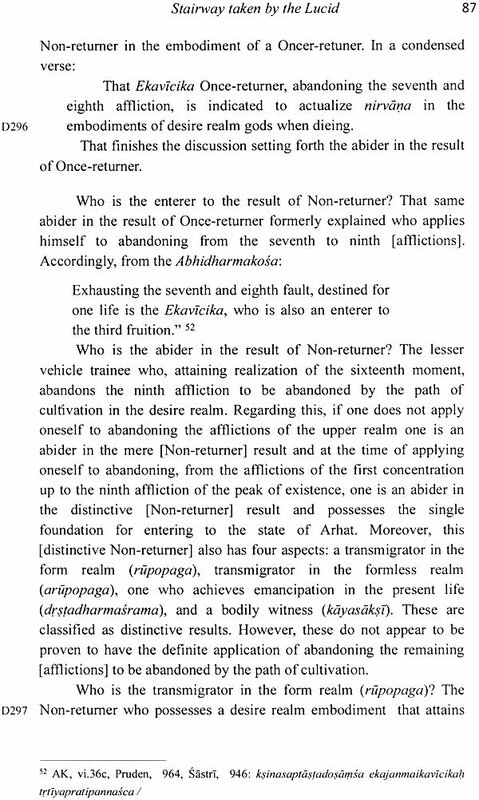 The exegesis of Noble beings in Tibetan forms of Buddhism developed as a special topic within the Tibetan monastic curriculum for a number of centuries and descended from lineages of Indian and Tibetan Buddhist commentators of the The Ornament for Clear Realization (AA; abhisamayalamkara = mngon par rtogs pa’i rgyan) tradition. This commentarial scholastic topic became known as the “Twenty Samghas” (Skt. vimsatiprabhedasamgha, Tib. dge ‘dun nyi shu). The “Twenty Samghas” in Tibetan forms of Buddhism refers to the stages through which Noble Beings (Skt. arya, Tib. ‘phags pa) may pass in their progress toward nirvana through various lifetimes in various cosmological realms. 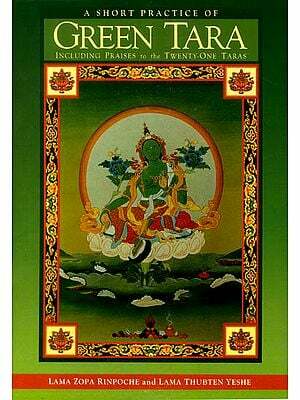 In medieval Indian Buddhist and Tibetan Buddhist commentaries up to the present day, the subject matter of the “Twenty Samghas” encompasses a comprehensive list of the stages through which Noble Beings (arya) may pass in their progress toward nirvana. This typological list of twenty does not provide a description of anyone individual’s path to awakening; rather, it enumerates all of the possible stages through which any given individual might pass, depending upon factors such as that individual’s cosmological circumstances and the acuity of her or his faculties. The Twenty Samghas therefore presents the defining characteristics of these individuals, providing a complete picture of all possible states on the path to awakening. Indian and Tibetan Mahayana Buddhist scholars regard this topic as crucially important, and its importance is reflected in the inclusion of the Twenty Samghas in the ten topics of special instruction (avavada) mentioned in the body of literature surrounding the systematic study of the AA. The exegetical system of the AA stipulates that bodhisattvas must train in these topics of special instruction in order to attain complete omniscience (sarvakarajnata). The key term in this citation from the Dalai Lama is samgha (Tib. dge ‘dun), which in its South Asian context generally refers to an assembly, crowd, group or community. The term has a long history in South Asia, as it was used in pre-Buddhist India to refer to a merchants’ or artisan’s guild, the ruling council of a royal family, or to a religious community. The term samgha also referred to a group of seekers who gathered around a master in order to attain, with his help, spiritual knowledge and realization of the highest truth. Sakyamuni Buddha was sometimes described as the leader and teacher of a body of monks and his “samgha” consisted of at first monks (bhiksu), novices (sramanera), lay followers (upasaka), and later on nuns (bhiksuni). Since the way of life of the Sakyamuni’s samgha was determined by rules established in the Vinaya code, the term Samgha in this context meant a religious body adhering to particular views and rules of discipline (ditthisilasamannasamghatabhavena sanghoy). unsurpassed field of merit in the world. The samgha, often called the congregation, is compared to the nurses or medical assistants of the Buddha. They are meant to have successfully taken in the Buddha’s teaching and to be faithfully administering it to other beings. 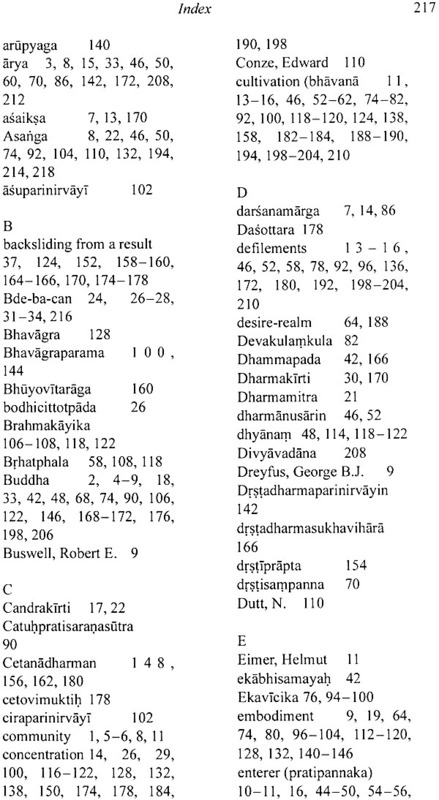 Tibetan scholars classify the samgha into two general categories: the conventional samgha (Tib. kun rdzob pa’i dge’dun) and the samgha in the highest sense (Tib. don dam pa’i dge ‘dun). The conventional samgha usually signifies a group or five or more monks (Skt. bhiksu, Tib. dge long) who perform rituals and recite the Pratimoksa vows together. The samgha in the highest sense signifies individuals who have achieved the Path of Seeing (darsanamarga) and are actualizing the Truth of Cessation (nirodhasatya) and the Truth of the Path (Skt. marga, Tib. lam). In the Stairway, as well as in his Golden Garland (220.12) commentary to the Abhisamayalamkara, Tsong kha pa examines the samgha in its highest sense from a Tibetan perspective in which various Indian Buddhist sources are compiled together to form a unified exposition. Tsong kha pa classifies the definition of the samgha jewel into two parts in the Golden Garland, the system according to the sravaka vehicle and that according to the greater vehicle, the Mahayana. The definition for the sravaka vehicle is our focus here, as it is the enumeration of sravaka Noble beings that is found in the following translation of the Stairway.